BeerHeadZ Nottingham Station took its first award last night – ironically Nottingham CAMRA’s Cider Pub of the Year! 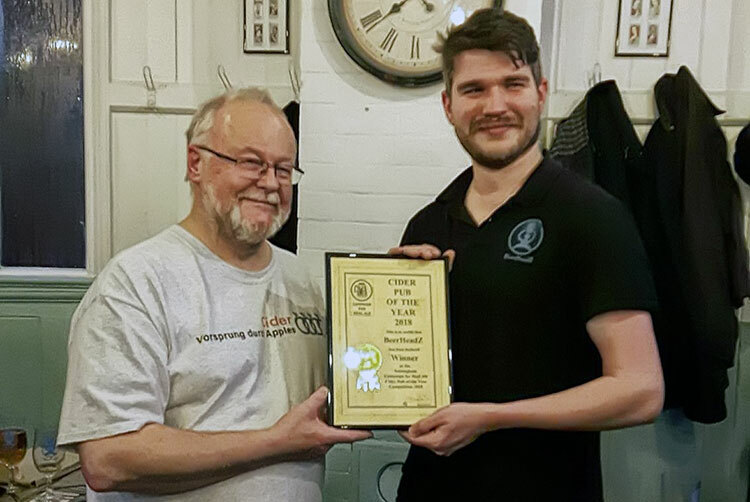 Manager Greg Downing was presented with the certificate by Nottingham CAMRA’s Apple rep Ray Blockley, who praised the pub for stocking less widely available brands therefore supporting the small independent cider makers. A good choice of ciders and perries was available, including Janet’s Jungle Juice and Hartland’s Farmhouse Perry. Greg thanked just about everybody on earth and then got on with the important business of quality control. A great night and another certificate for the BeerHeadZ wall!